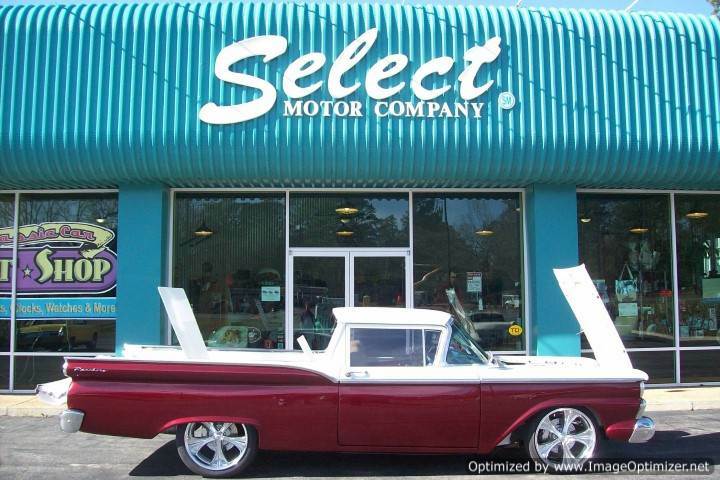 This 1959 Roush Ford Ranchero Resto Mod is an example of the custom hot rods we build at Select Motors. 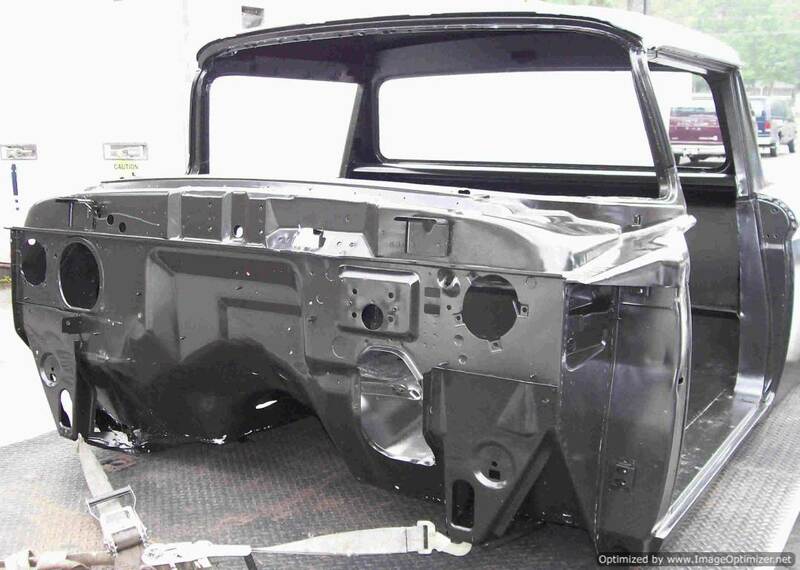 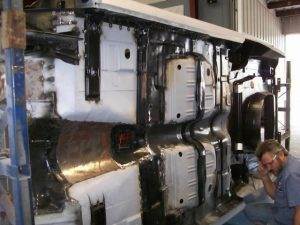 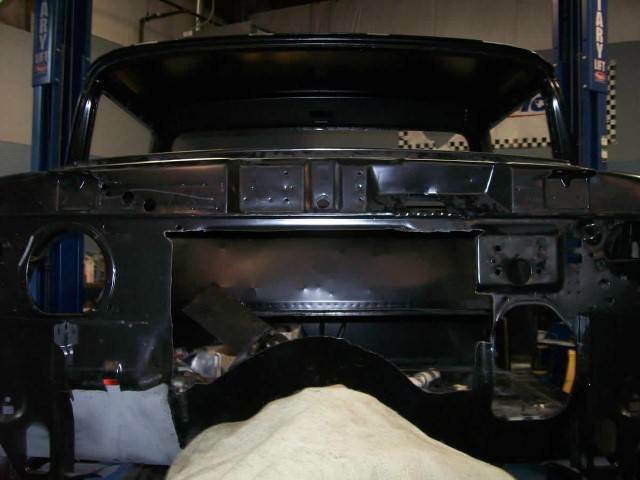 This 1959 Roush Ford Ranchero resto mod build began by disassembling the body for our rust removal process of baking, acid dipping, and electroplating. 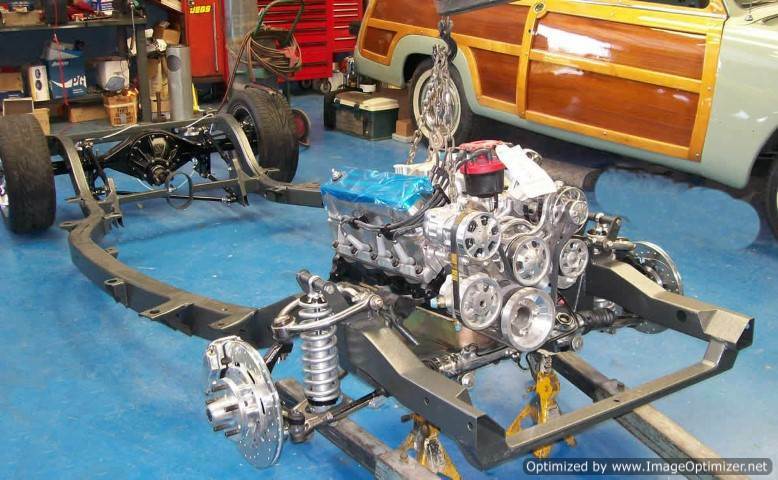 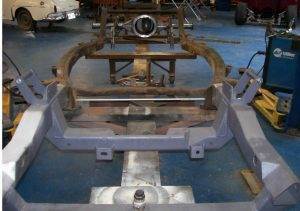 While the body was out bathing in truth serum, the chassis shop was putting together a plan for a custom chassis. 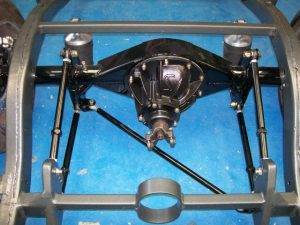 For the front suspension, we chose a Fat Man Fabrication weld-in front clip for its ability to lower the ride height, improved caster, rack and pinion steering, stainless steel control arms and our choice of 13” drilled and slotted Wilwood brakes with polished calipers. 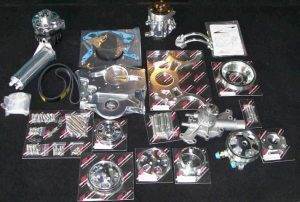 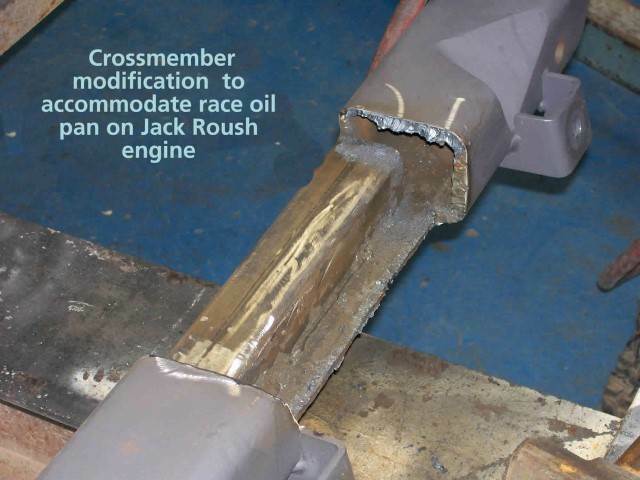 Our customer provided a Jack Roush Racing 342R, a 302 based stroker engine which produces 460 horsepower. 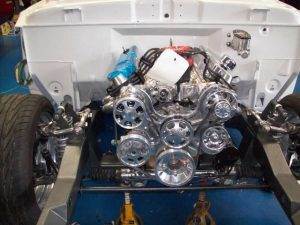 In addition to the 460 horsepower, a 300 shot of nitrous was added. With a possible 700 or more horsepower passing through our drive train our chassis shop choose a 9” Ford differential with a power trax positive traction unit and 3.73 gears. The differential was also outfitted with 12” Wilwood drilled and slotted brakes. A fabricated four link with adjustable control arms would be welded into the chassis and onto our new differential. 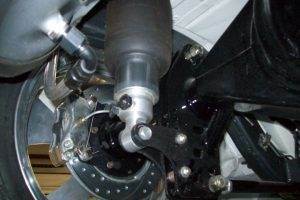 For our four-link to plant the tires, the Fat Man front cross member was modified to move the front of the engine back as far as the front of the control arms. 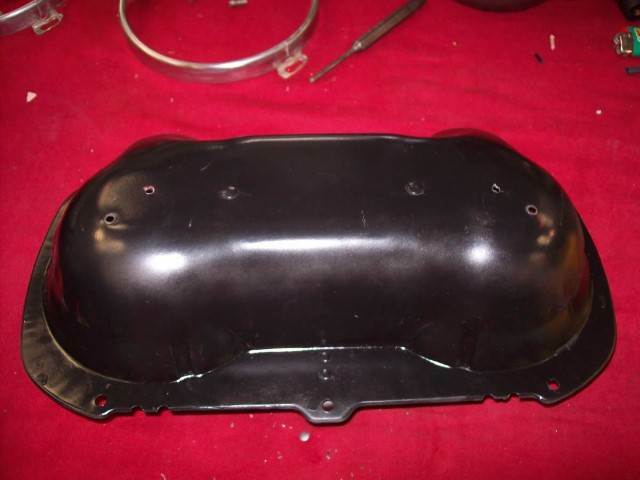 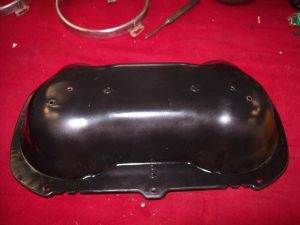 A rear sump oil pan was installed; however, rear sump small block Ford oil pans also have a small sump in the forward section of the oil pan to cover the oil pump. Some very creative cross member construction and a re-locator kit for our oil filter and our engine were set up for weight transfer. 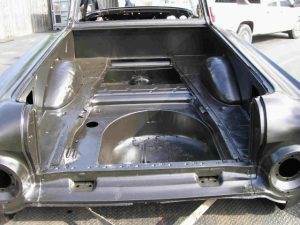 When the body was stripped, it had given up a considerable amount of rust in the rockers, lower quarters, inner fenders and floors. 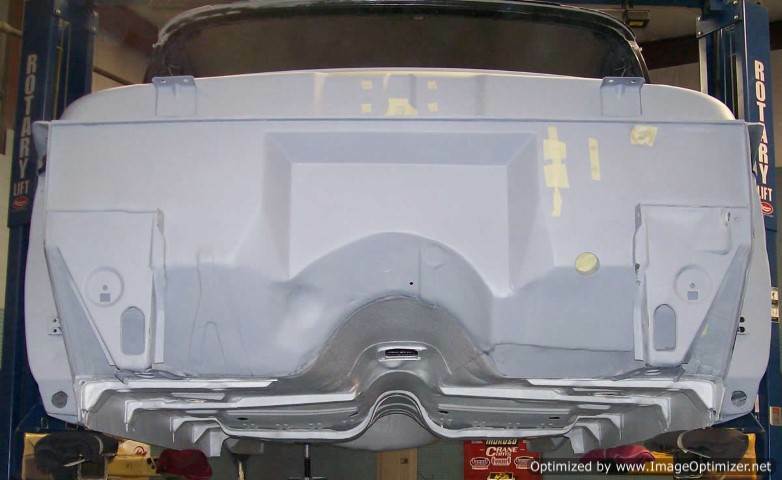 Modifications for added accessories lead the way through repairs on the body. The firewall would need to be recessed for our engine placement and squared up. 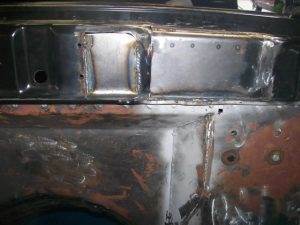 The original firewall had some asymmetrical construction to allow for a wiper motor, and we would be using a remote wiper motor mounted inside under the dash. 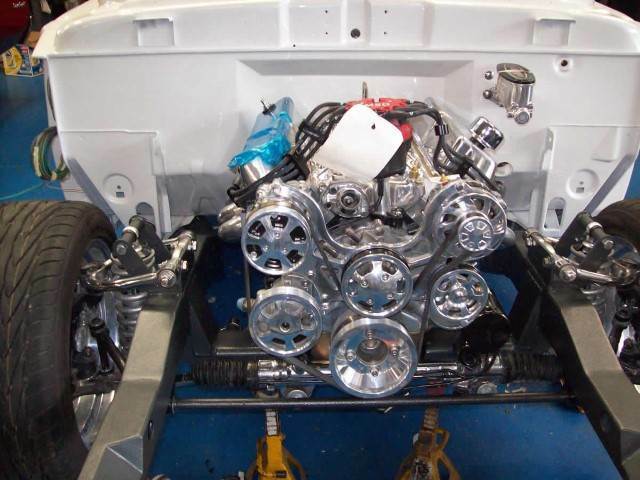 Our customer had delivered a Tremec five-speed transmission with his engine and so the drive train tunnel was raised, and a shifter position was located corresponding to the transmission. 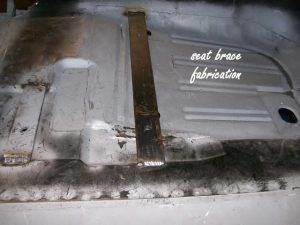 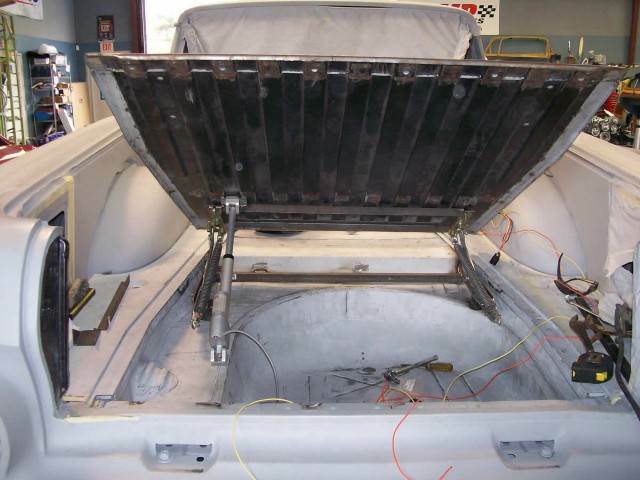 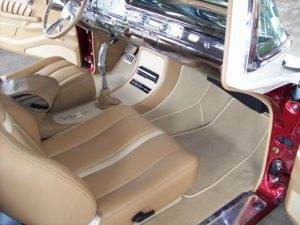 Although floors were not available for a ’59 Ranchero, we would be using bucket seats incompatible with the original floors. 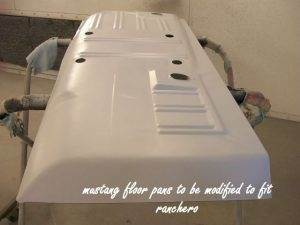 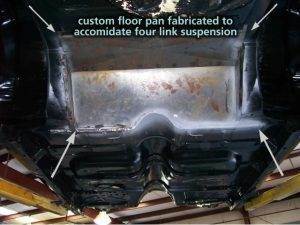 A set of ’67 Mustang floors were modified to repair the floor. 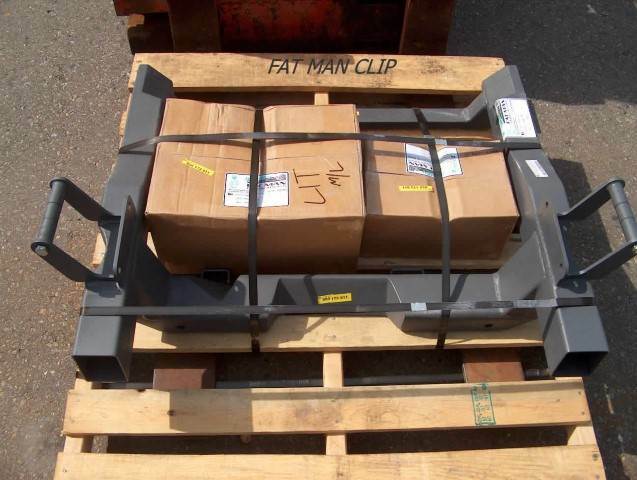 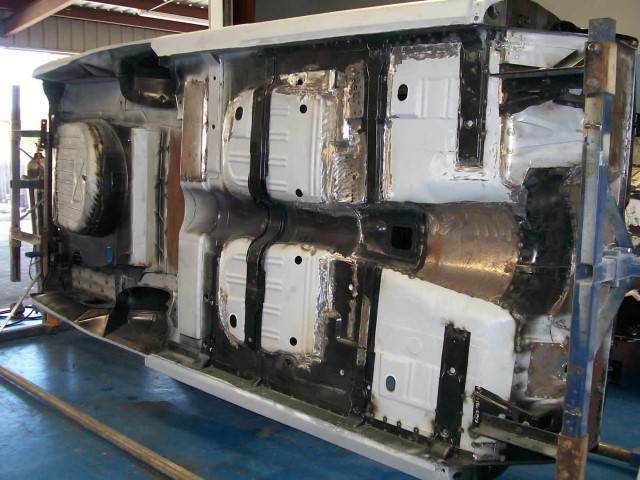 In the back of the vehicle, the over the axle panel would need to be lengthened to cover our four-link. The inner rockers, outer rockers, and outer lower quarter panels were available which is surprising because ’59 Rancheros have a very limited reproduction market. 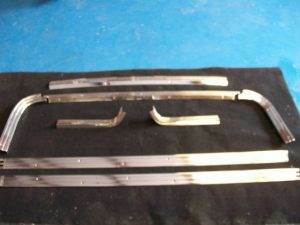 Many of the rusted out floor braces were available, and those that were not available were fabricated in house. 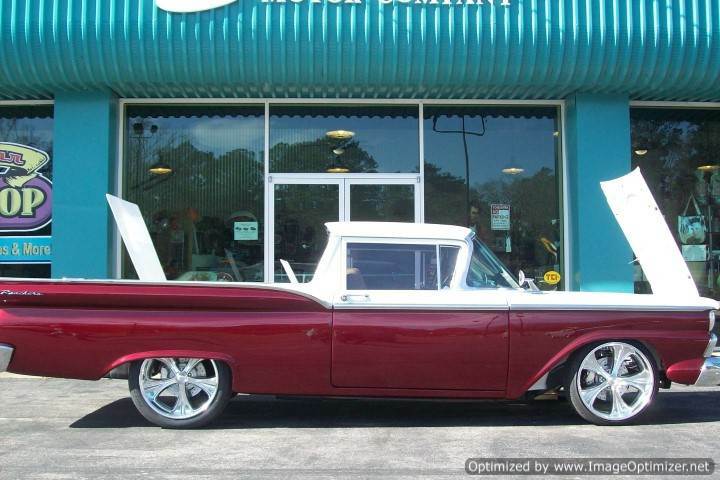 The Ford Ranchero and the Chevrolet El Camino for that matter are based on station wagons. When we removed the bolt in bed floor from our Ranchero bed, foot wells and tire wells were exposed on the station wagon floors. 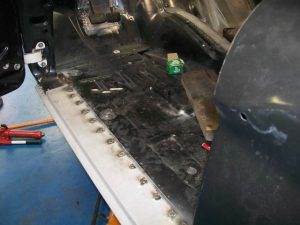 A tremendous amount of space behind the cab and under the floor became storage for our Air Ride control unit and the house battery. 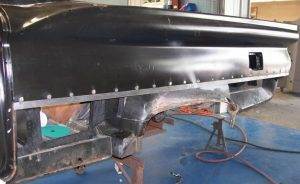 Our new over the axel panel consumed much of the space under the midsection and behind the axel was a spare tire well which became nitrous storage. The original bed floor was cut in three pieces. 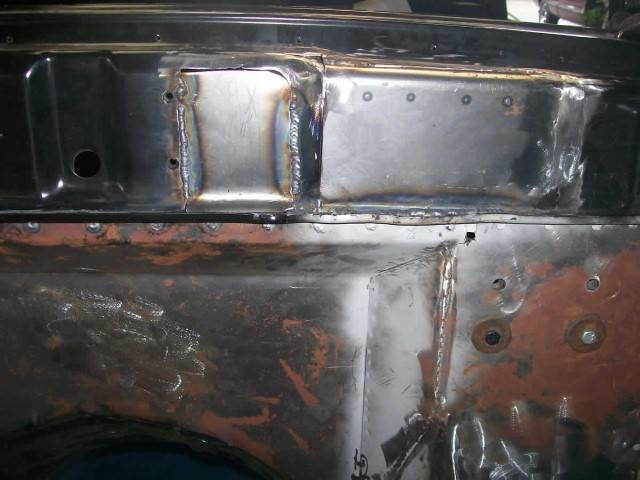 One was welded over the axel panel. 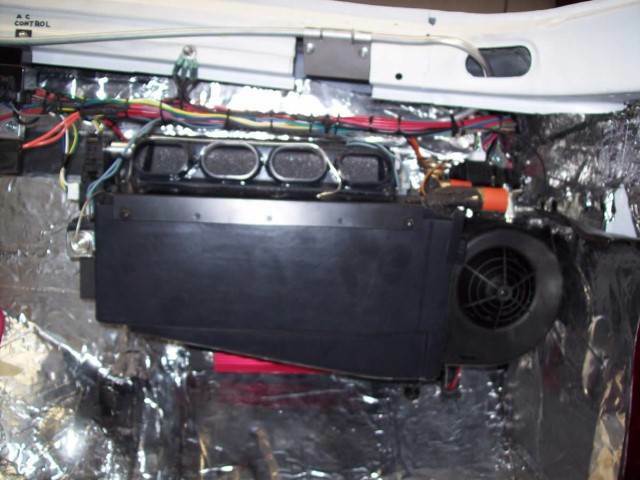 One was built into a door behind the cab for Air Ride and battery storage and of course, the last door was over the nitrous storage. 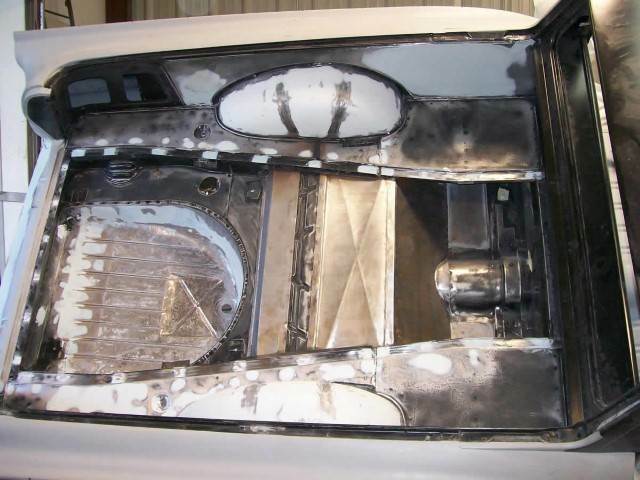 The doors would be opened and closed with linear actuators from the rear with a hinge on the front. This design was chosen to mimic the rear opening engine compartment found on ’59 Rancheros from the factory. 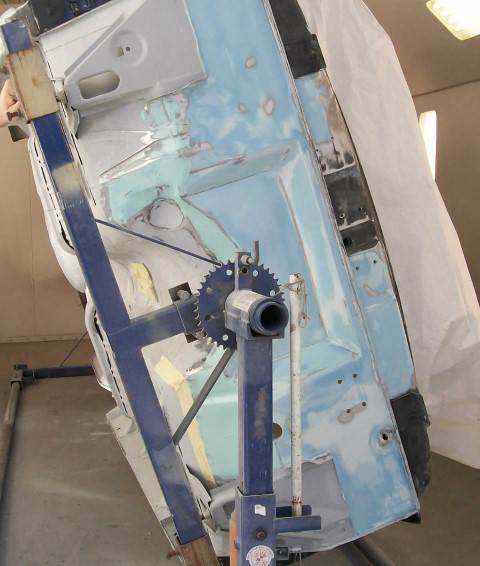 When the body modifications and repairs were completed, it was placed on a rotisserie and moved into the body shop. 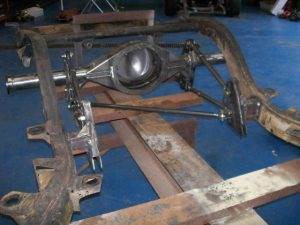 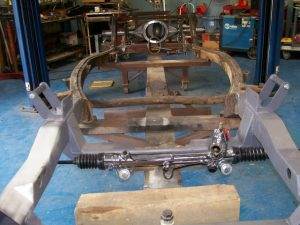 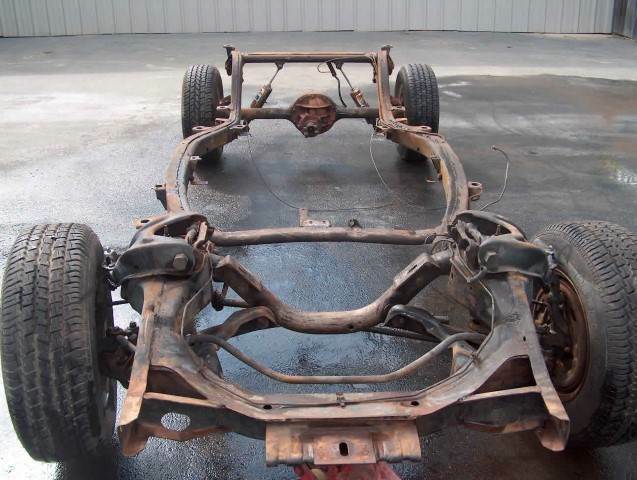 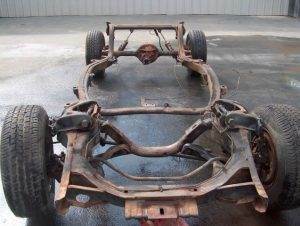 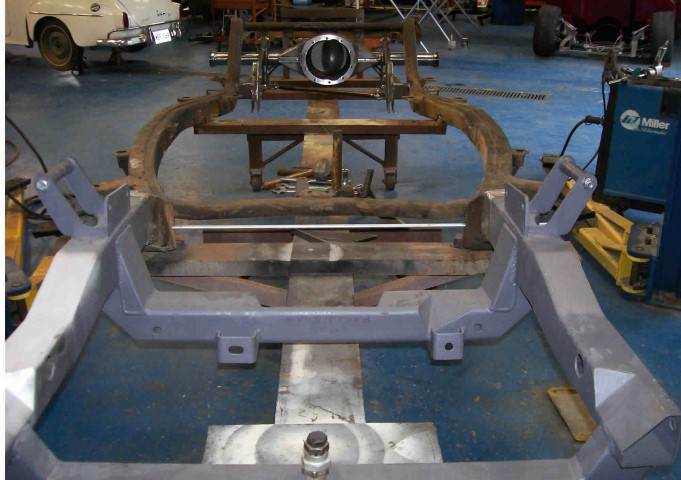 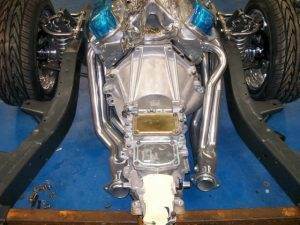 The chassis was then stripped down and sent out to be acid dipped and powder coated. The stainless steel trim down the body around the windshield, back glass, and the bed was sent to a professional stainless straightener and polisher. 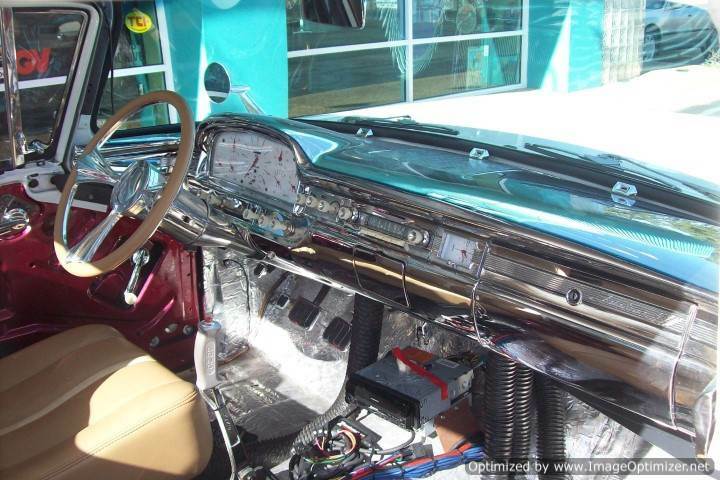 The bumpers, door handles, grill bar and dashboard were sent out for show quality chrome. 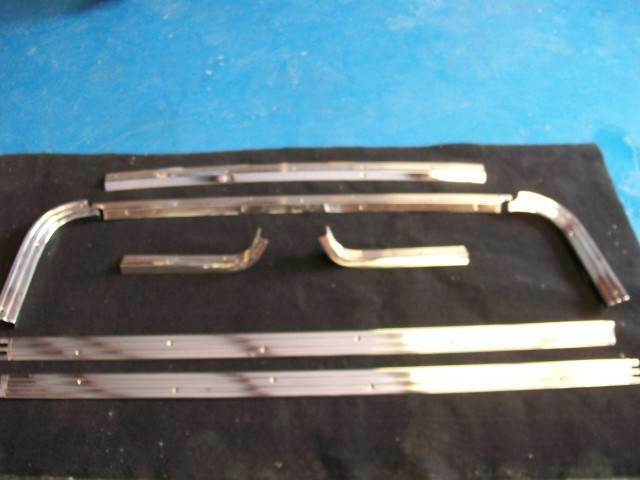 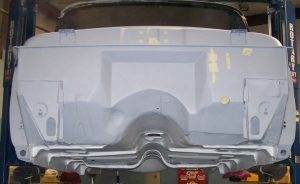 The aluminum pieces such as headlight buckets, tail light buckets, the grille and marker light lens buckets were sent out to be stripped of anodizing, polished and re-anodized with bright dip anodizing. 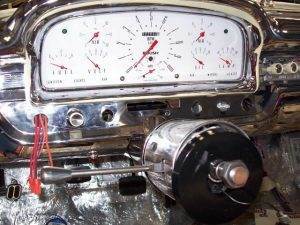 The large needle in the center, which was once the speedometer needle, was now the tachometer, for our high revving Roush motor. A small needle below the tachometer would be the speedometer. 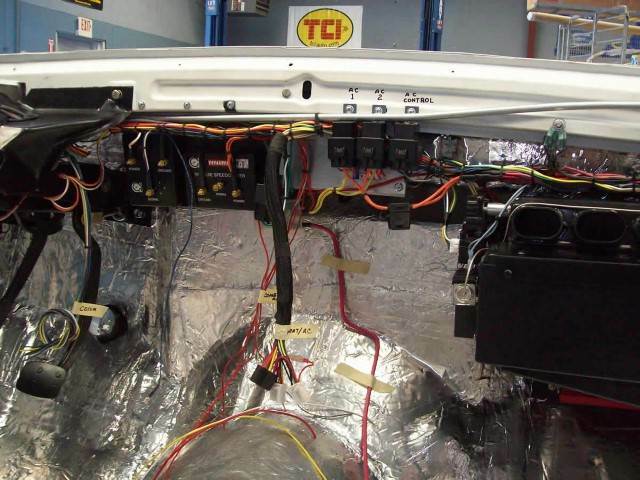 Fuel, volt, oil and temp gauges are situated across the bottom of the new cluster. Originally the dash had two knobs; labeled air on the cluster. These knobs were once for fresh air ventilation; they would now operate the rear air ride and a gauge above each knob situated in the new cluster would read pressure for each shock independently. The new instrument cluster has green LEDs for the turn signals, yellow LEDs for the RPM actuated shift light and is surrounded by unseen LEDs for illumination. 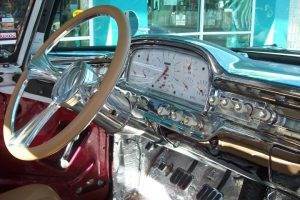 Inside the vehicle, a Flaming River chrome steering column was chosen to go with our chrome dash and chrome brake, clutch and accelerator pedal set. 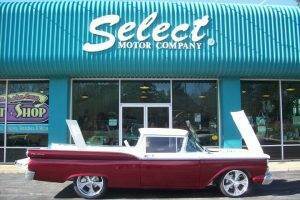 A steering wheel from Billet Specialties, which was very similar to the Boyd Coddington 20” alloy wheels to be used on the car, was chosen by our customer. 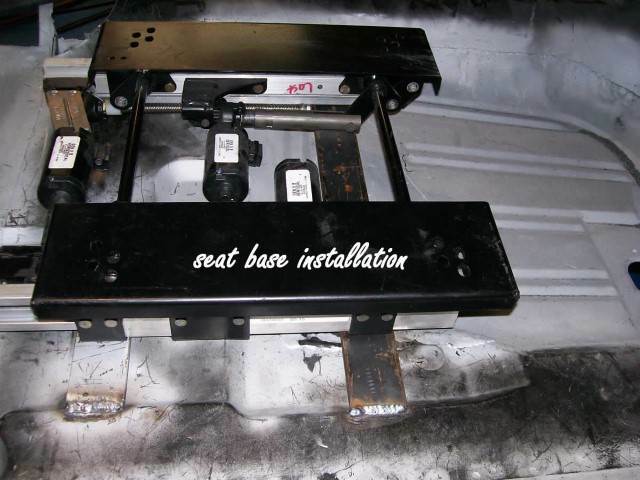 Our bucket seats came from Wise Guys Seats and are six-way power with power lumbar supports. 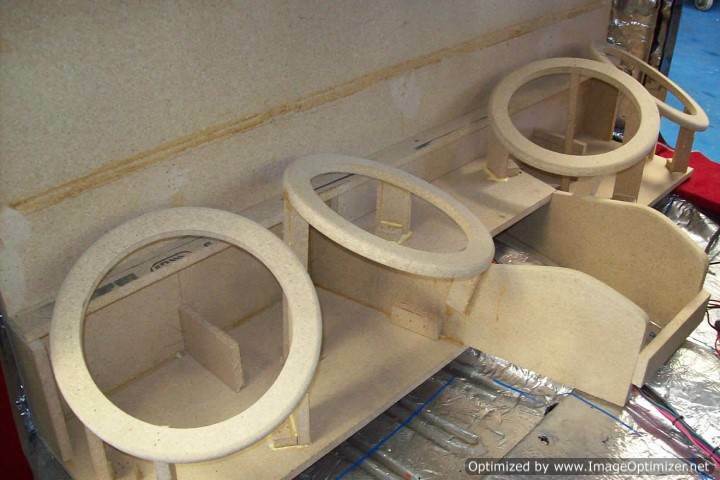 The seats would be covered later when an entire custom interior was built. 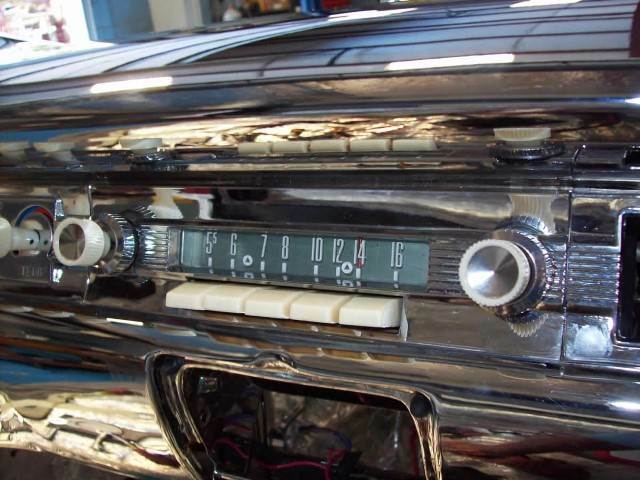 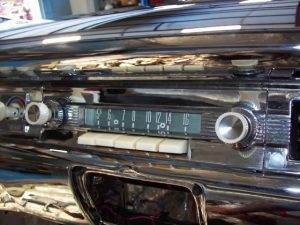 A killer stereo was part of our customer’s order. This order would require a Pioneer AVIC – N5 head unit, four Diamond Audio D610DZ Diamond Audio D66ZS 6 1/2” separated in the doors one pair of Diamond Audio D65ZS 5 ½” separated in the enclosure, an Alpine MRP-1000 amplifier on the sub-woofers and an Alpine MRPF-600 amplifier on the mid and high ran ge speakers. 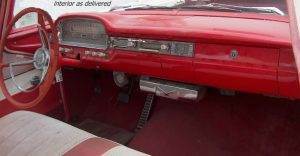 An enclosure to mount all of this cool hardware was built and painted with the candy red paint used on the body. 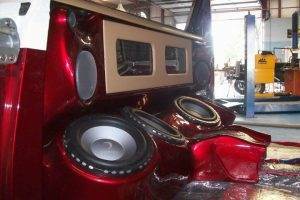 The center of the stereo enclosure crawls forward in between the bucket seats and is the beginning of the center console from the rear. 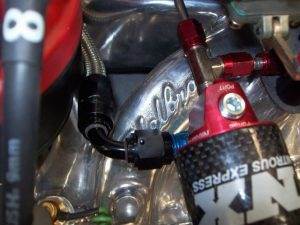 Under the hood a Billet Specialties Tru Trac accessory system with serpentine belt and polished aluminum accessories was used. 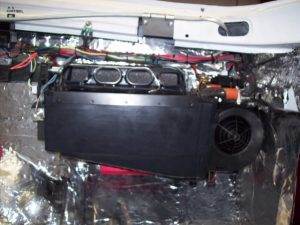 A Be Cool cooling system with horizontal tanks was a close fit for our radiator support. 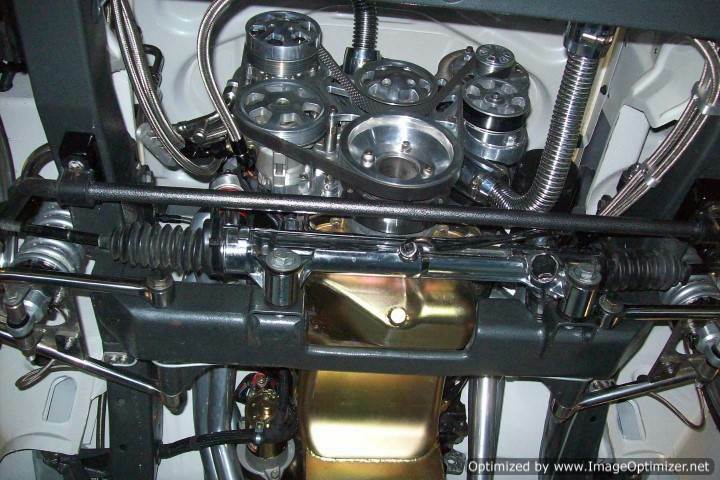 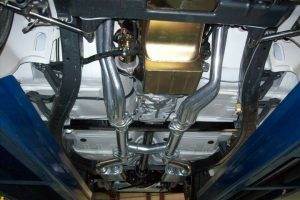 We tied the engine and cooling system together with chrome plated copper radiator hoses. 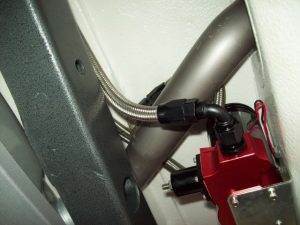 We plumbed in an Aeromotive fuel system with braided stainless steel hoses which should be good for 1000 horse power or better. 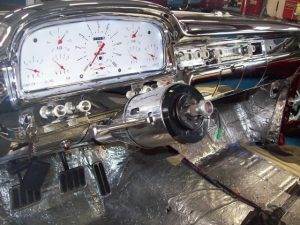 Our air conditioning system was built around a Classic Auto Air street rod evaporator system with electric servos. 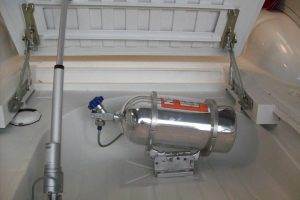 We built the remainder if the air conditioning system piece mil in house and plumed the system out with stainless steel fittings and teflon lined stainless steel air condition and heater hoses. 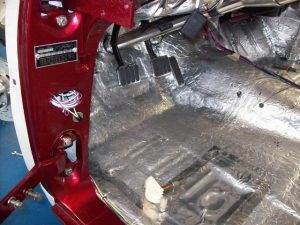 The entire interior of the vehicle was lined with Second Skin thermal and acoustical liner. The wire harness used to wire our Ranchero was a Painless wiring harness in which you terminate the wires with out sourced ends. 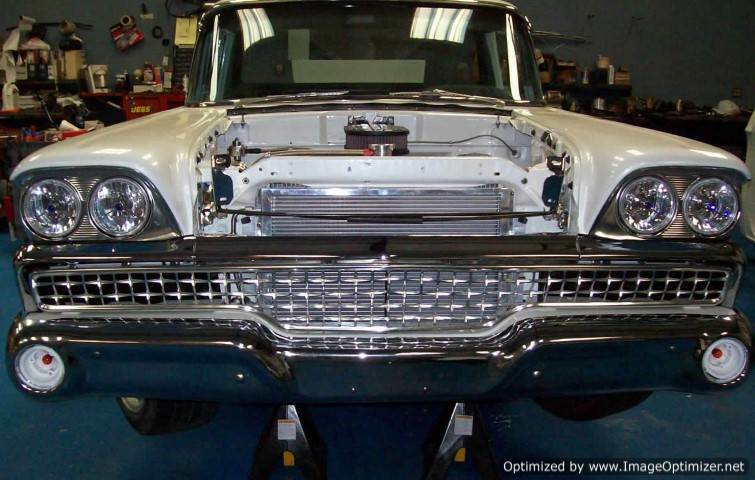 Several good sources for wire connectors and an experienced A & P mechanic and our Ranchero was ready to fly. The end product is a beautiful candy red and white pearl ’59 Ranchero that comes alive in the sun and performs in every arena requested and then some. 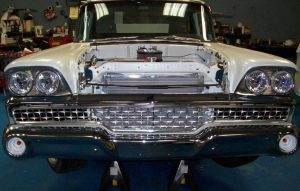 We hope you enjoyed reading about this 1959 Roush Ford Ranchero Resto Mod. 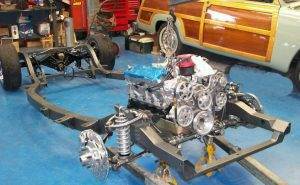 It is just a sample of the custom street rods we build. Please browse through the services we provide. 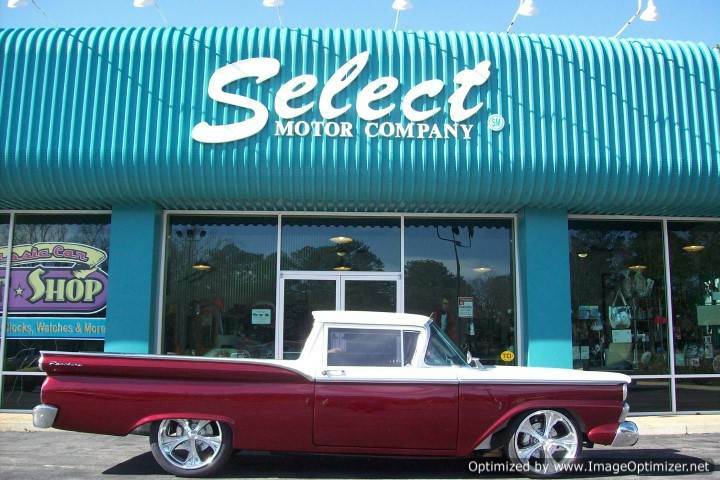 You will quickly see how Select Motors has become Louisiana’s premier auto restoration shop. 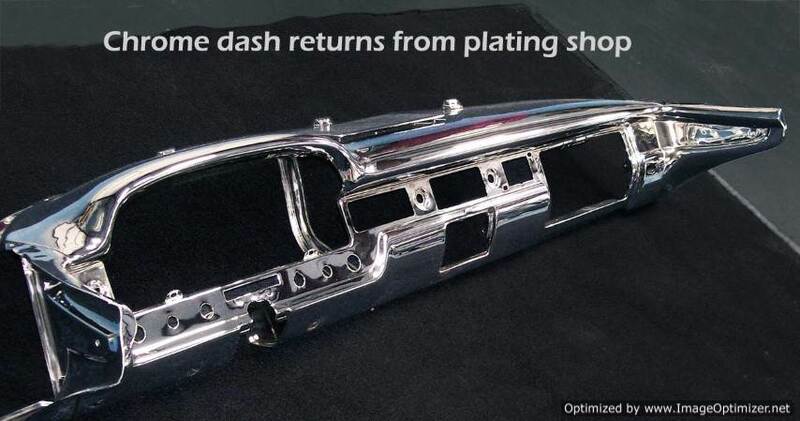 Are you looking for a a shop to restore or repair your classic car? 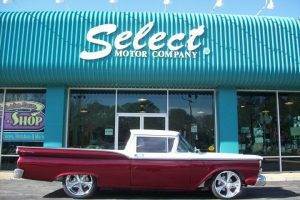 We are available Monday through Friday 8-5 to discuss your classic car or truck needs.